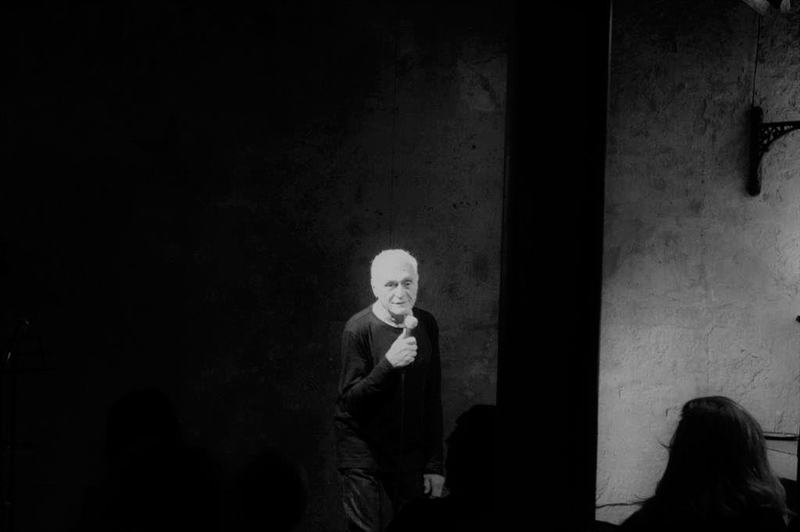 Performance John Giorno, Blago Bung 10. Dada 100. Cabaret Voltaire Zurich , avril 2016. 2016 marks the hundredth anniversary of the birth of the seminal art movement known as Dadaism. The internationally renowned artists group Blago Bung will celebrate with performances and events scheduled in Zurich and New York. One hundred years ago, while the First World War raged and war machines blasted human beings to bits, artists like Hugo Ball, Emmy Hennings, Marcel Janco, Tristan Tzara and Jean Arp took refuge in neutral Switzerland letting out a creative scream against the insanity of war. This impingement of freedom resonates anew today as religious fanaticism, political radicalism, and deliberate promotion of anti-scientific stupidity take the world to new depths of calamity. 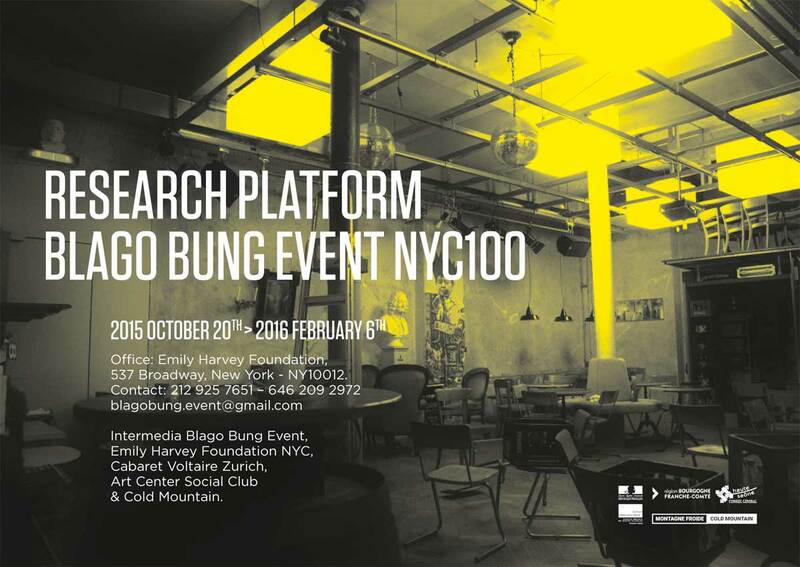 Blago Bung, its name taken from an onomatopoetic term invented by Hugo Ball in 1916 perhaps to denote a bomb explosion and its echo, has been creating performance poetry concerts in Zurich and New York for 10 years. 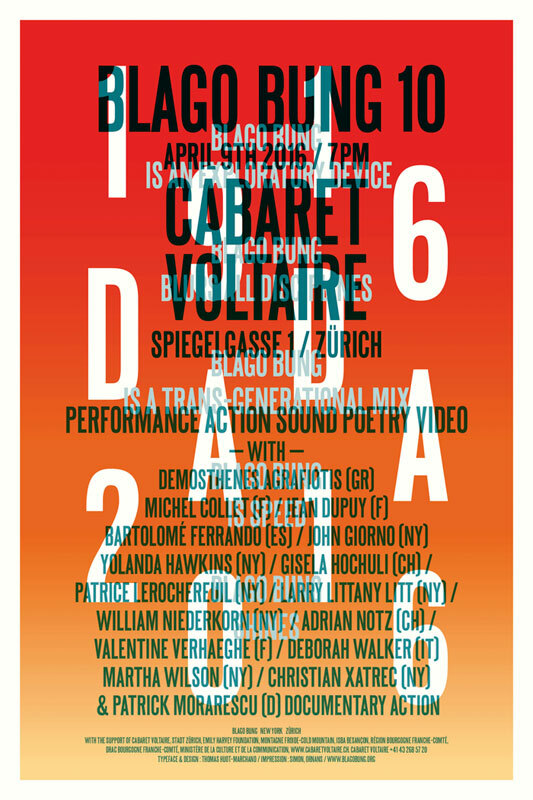 Blago Bung 10, will be held on April 9 at Café Voltaire, site of the original Dada performances in Zurich. The final events in the series are scheduled the following October in New York. Inspired by Stéphane Mallarmé, the great poet who opened French poetry to avant-garde and intermedia devices, Michel Collet conceived of Blago Bung as a cultural bridge between Europe and America. Curated by Collet with Patrice Lerochereuil starting in 2007, Blago Bung's first performances as well as most subsequent ones were presented at the Emily Harvey Foundation Gallery, a genius loci founded by Emily Harvey and dedicated to the Fluxus movement, whose prime mover, George Maciunas, staged many events and shows there. Acknowledging the advice of the French artist Jean Dupuy, the curators along with Valentine Verhaeghe have developed the Blago Bung model placing artists at the center of all facets of their work as organizers, eliminating the traditional curatorial hierarchy thus freeing them to experience the concept of total production and artistic experimentation. The idea is deliberately low tech: The artists or poets just get up and perform their work after the briefest of introductions when it is their turn in the order of presentation. Blago Bung is a “meta-ecriture” in which every artist presents actions, dance or no-dance, art and no-art, performances, poetry, video, sound works. The pieces unfold quickly, come together randomly and collectively, imparting a character of diverse tonicity and joy. Audiences experience free association, dream weave, the society imagined by Charles Fourier. The dynamic is to be present, irrepressible, linked to theoretical research, play, philosophy, politics, aesthetics, poetry and movement on an unpretentious stage for vibrant original provocative performances. Over the years the list of poet performers who have presented work at Blago Bung is an international achievement in itself: Demosthenes Agrafiotis, Beatriz Albuquerque, John Armleder, Michel Auder, Soren Berner, Julien Blaine, Michel Bulteau, Zabo Chabiland, Todd Colby, Michel Collet, Gérard Collin-Thiebaut, Michel de Broin, Charlie Doria, Paul Dorn, Christoph Draeger, Jérôme Dupin, Bartolomé Ferrando, Fred Forest, Kendell Geers, John Giorno, Masha Godovannaya, Jacques Halbert, Eleanor Heartney, Yolanda Hawkins, Glory Hazel, Swetlana Heger, Gisela Hochuli, Heidrun Holzfeind, Per Hüttner, Daniel Jacoby, Pierre Joris, Adam Kahan, Moriz Kalbe, Nicolas Kerksieck, Alison Knowles, L. Brandon Krall, Nicola L, Arnaud Labelle-Rojoux, Bob Lens, Patrice Lerochereuil, André Eric Letourneau, Katherine Lieberovskaya, Larry Littany Litt, Nicolas Maigret, Deven Marriner, Larry Miller, William Niederkorn, Boris Nieslony, Jeffrey Perkins, Nicole Peyraffite, Alexandra Phillips, Michael Portnoy, George Quasha, Lutz Rath, Taketo Shimada, Neboja Seric Shoba, Joao Simoes, Marina Temkina, Moira Tierney, Yann Toma, Fatos Ustek, Roger Van Voorhees, Valentine Verhaeghe, Roland Wagner, Deborah Walker, Paul Wiegerinck, Dennis Williams, Christian Xatrec.